So, as I’ve mentioned a time or two (or seven), I recently was blessed to be able to spend a couple weeks in Italy and Croatia experiencing the culture, history, and food. Lots of food. Food all the time. As anyone who has ever traveled with me can attest, I pretty much need fed constantly when I’m traveling. And then my next thought is what we’ll eat next. I take it very seriously. I may have a problem. At the hotel we stayed at for several days in Grosseto, Italy, the menus were set for every meal since we were such a large group. Most of them were adequate, but there were a couple dishes I absolutely loved and decided I had to try and recreate as authentically as possible when I got home. 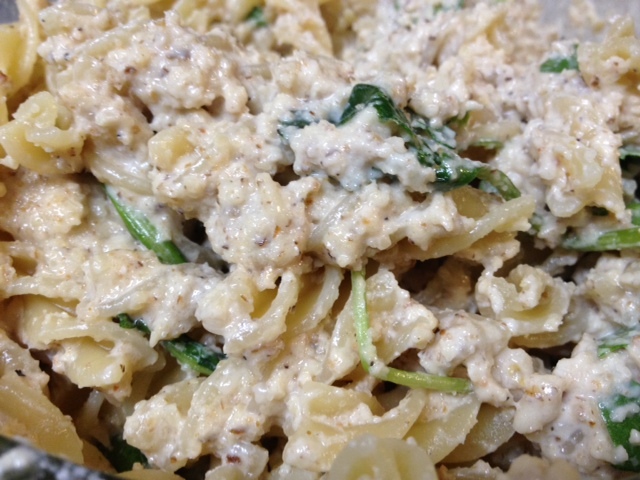 One was this pasta with walnut sauce and rocket (basically like arugula). 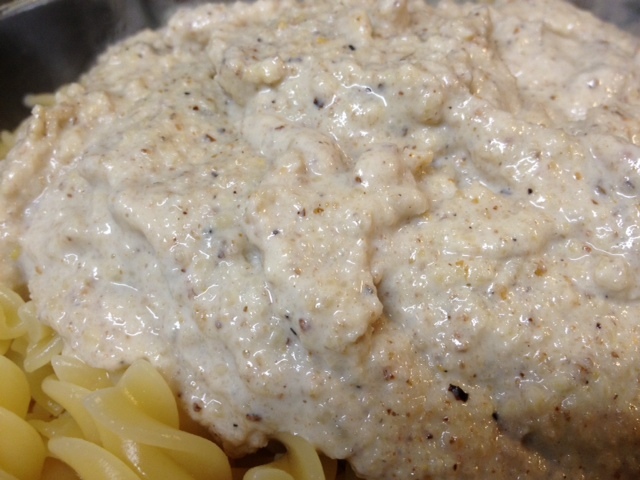 So I’ve been Googling all sorts of recipes for an authentic Tuscan walnut sauce, and found a few. I decided to try two of them out and see if either came close to the one I ate in Italy. So behold my first try. This one (we’ll call it version one) was quite tasty. Not quite the same exactly as I had in Italy, but still a pretty great flavor. 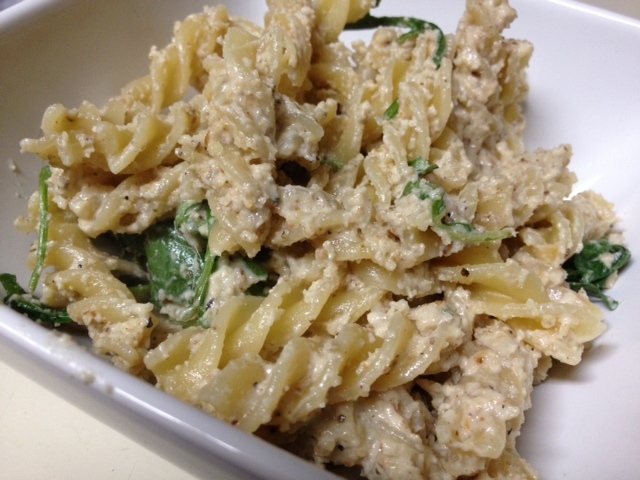 The walnuts gave it an interesting grainy texture that my pasta sauces don’t normally have, so that was a nice difference. Because it had nuts, it was quite filling too! 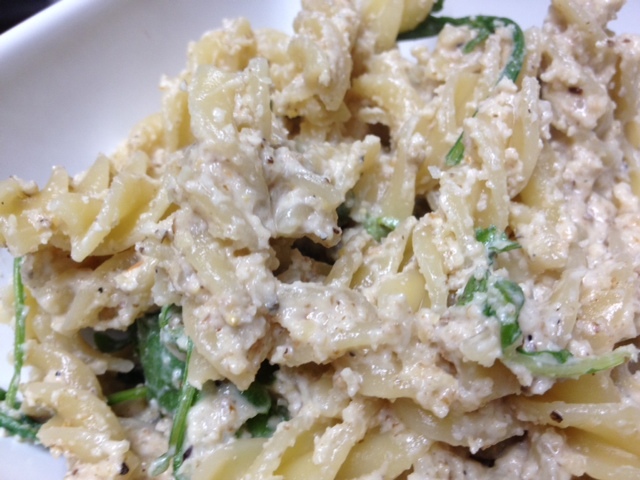 This is the delicious pasta with walnut sauce and rocket that I’m trying to duplicate. The hotel in Grosseto, Italy, served this to us the last night, and I loved it! First set a pot of water to boil. When it’s boiling, add a small handful of salt and the pasta, and stir. Cook according to directions. I like my pasta quite al dente, so I cook a minute or so less. 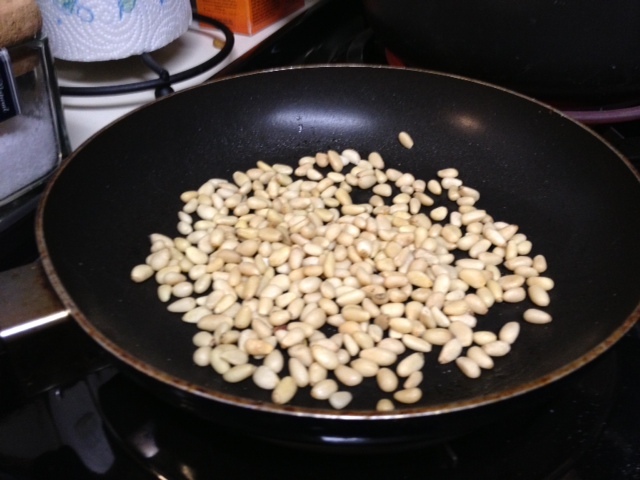 In the meantime, toast the pine nuts in a dry pan for about three minutes, tossing frequently so they don’t burn. They should be golden and fragrant. 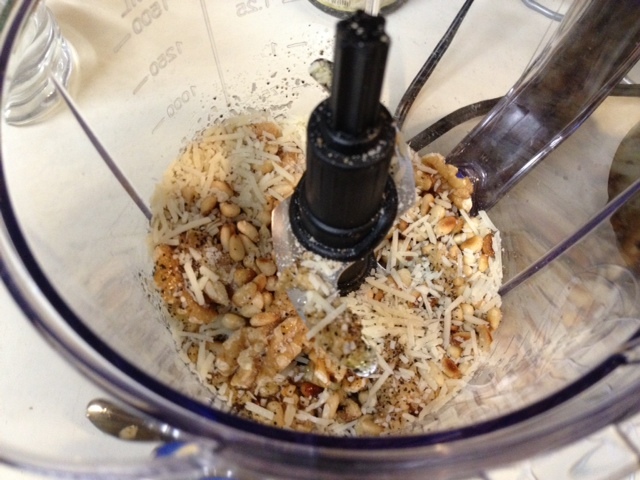 Add the walnuts, bread crumbs, pine nuts, parmesan, garlic, salt, and pepper to a food processor. Blend until it becomes crumbs or a kind of paste. If using cream, heat until it comes to a light boil. 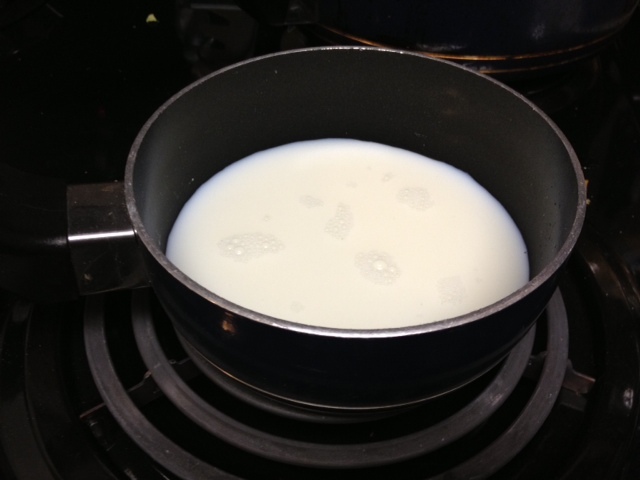 If using milk (I used skim), heat until it’s simmering, but don’t bring to a full boil because you’ll scald the milk. 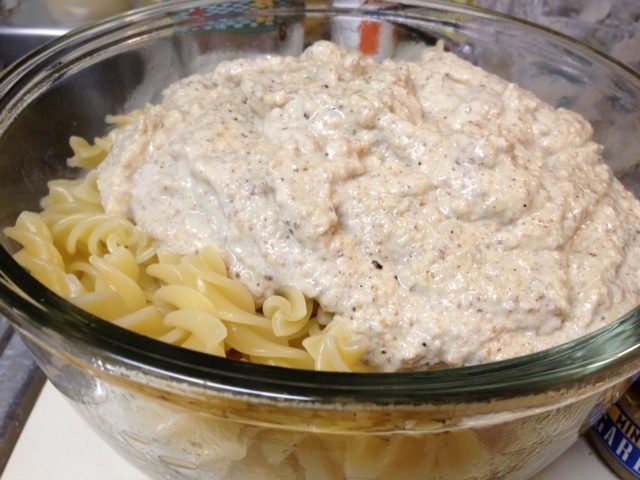 Pour the milk into the food processor and blend until it becomes a creamy-yet-grainy sauce. Drain the pasta and toss it and the sauce together. Add the rocket (or arugula), and toss as well. 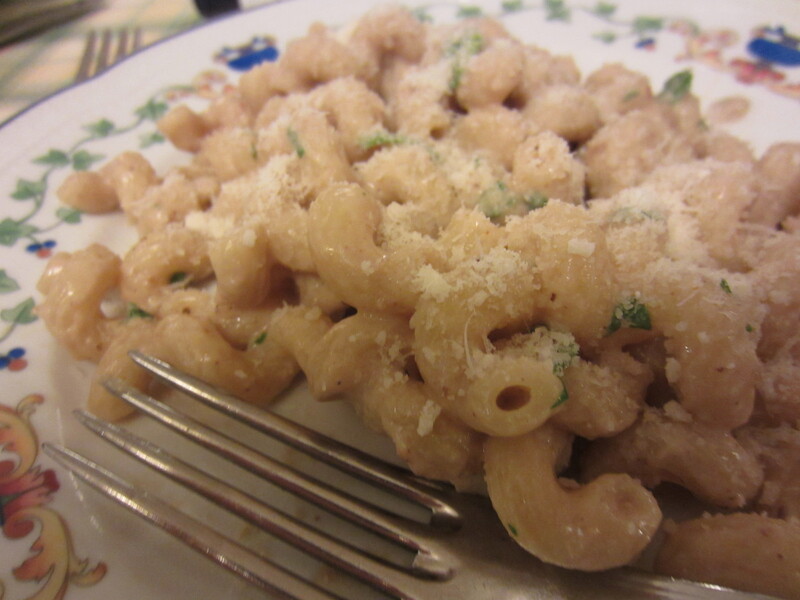 Serve hot and fresh (though it makes great leftovers), with fresh grated parmesan if you have it. 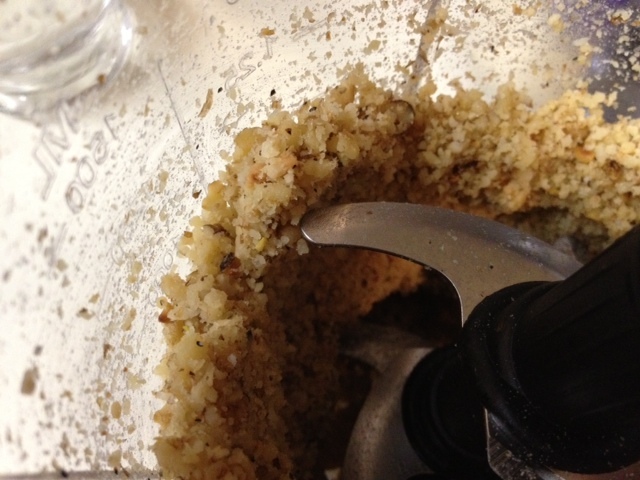 Blend the pine nuts, walnuts, breadcrumbs, garlic, olive oil, salt and pepper in a blender or food processor. Bring the cream to boil (if milk, bring to simmer), pour it over the nut mixture and blend it all together. 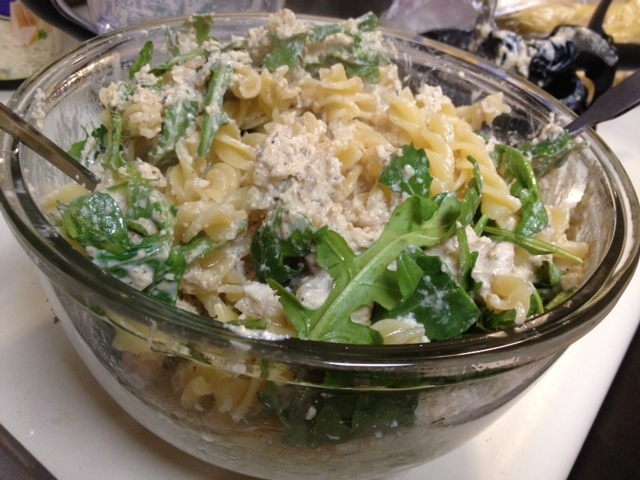 Toss together the walnut sauce with the drained pasta and rocket/arugula, serve with grated pecorino or parmesan and garnish with crushed walnuts.